Susanna Palkonen is the director of the European Federation of Allergies and Airways Diseases Patients’ Associations (EFA). Holiday destinations are not just a click away for everyone. Although in Europe we benefit from a wider choice between flying destinations, companies and prices, many passengers needing special requirements do not travel worry-free. Passengers under medical oxygen therapy, like many chronic obstructive pulmonary disease (COPD) patients, are reporting huge hurdles when booking and taking flights, including discrimination and unacceptable health risks. More than 3.5 million people need medical oxygen in Europe and many are frequently advised to travel to regions with temperate climates that will ease the symptoms of their disease. But when that possibility obliges the patient to catch a plane, many realise the countless difficulties that arise when organising a flight with medical oxygen today. EU law on the rights of disabled persons and persons with reduced mobility when travelling by air foresees non-discriminatory access to air travel and free of charge transport of mobility and medical equipment. However, people travelling with medical oxygen are confronted with a complex and discretionary system, pricing obstacles, and procedure for validation which might differ among airlines. Moreover, some companies refuse to offer medical oxygen services onboard or on the ground, therefore denying oxygen-dependent people the right to travel. Others provide oxygen bottles free of charge. At EFA, we have been looking into this mobility issue after hearing the stories of COPD patients who were denied flying, overcharged or asked to turn off their oxygen during taking off and landing. Their testimonials are inconceivable. There is a clear need for harmonisation when it comes to travel with oxygen. It is not only a matter of availability and pricing for oxygen supply on board, it is also a question of administrative standardisation. Many airlines do not explain their special assistance policies on their website, and when it comes to the Medical Forms, the forms and process are not harmonised. At EFA we are asking for the harmonisation of airline policies and request procedures to travel with medical oxygen. In the meantime, we have launched a website for patients to compare and choose the airline that best fit their needs. 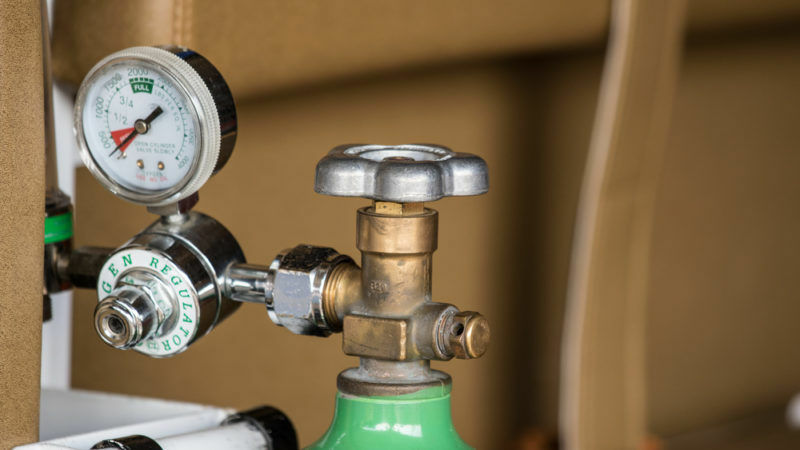 A patient that needs to inhale pure oxygen requires a medical device to do so, either through Portable Oxygen Bottles (POBs) that contain compressed oxygen or through Portable Oxygen Concentrators (POCs) that the pump air and convert it into oxygen. There are many models but only some are allowed inside a plane. When booking a flight, patients need to check if their machines are allowed onboard, and then contact their selected airline to inform about their trip, sending a medical form stating they are fit to travel and requesting their travel needs. The process might sound easy. But mostly it is not. Patient passengers needing medical concentrated oxygen often feel discriminated for the exorbitant price they are asked to pay for the company’s supply of oxygen. Although services and prices are discretionary when it comes to the private sector, we cannot but disagree with this practice. Current legislation does not allow passengers to transport liquids on board. Patients that need to use POBs as treatment are therefore obliged to purchase the oxygen onboard. Making patients pay a flight up to six times higher than the normal ticket fare just because of the use of oxygen onboard is unethical to us. It is abusive and poses a burden that many patients cannot afford. When we have talked to airlines chiefs to request a reasonable price and some decided immediately to review their policies, offering medical oxygen onboard for free. Others have refused to meet us. We will continue advocating for an end to this exploitation of patients’ needs. Then the big travel day arrives. Respiratory patients have carefully prepared their machine, batteries and oxygen to ensure they get treatment all the way. They are happy and ready to visit their family, friends or just have a nice break abroad like anyone else. But they need to confront the lack of awareness of many airport and airlines staff about passengers’ medical forms and medical oxygen. Check-ins and security checks are very tense for patients, who need to repeatedly show all their authorisations before taking off. Landing can turn stressful too. Delays, missed connections, luggage carrying their own oxygen bottles lost can leave the patient literally without oxygen. The possibility to find medical oxygen in airports is something patients cannot rely on in case of an emergency. Austria has solved this by pharmacies, including those at the airport train station while having the opportunity to recharge oxygen tanks in all pharmacies across the country. We are also requesting that airport pharmacies be equipped with medical oxygen, to provide a guarantee in case of oxygen gap from airport check-in to aircraft cabin and back. Accidents involving the death of oxygen-dependent passengers have been already reported. As they do not neatly fit under the categories of people with disabilities or reduced mobility, patients’ mobility is a grey zone. At EFA, we ask for the use of the precautionary principle to ensure patients mobility rights while protecting their health. After all, we are all 100% dependent on breathing, on the go or not.